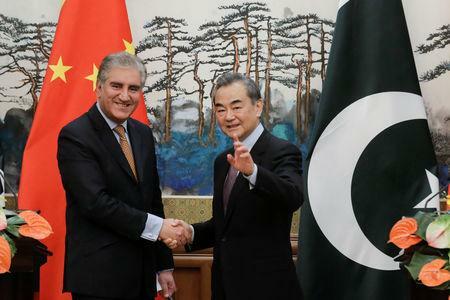 BEIJING (Reuters) - Pakistan Foreign Minister Shah Mahmood Qureshi told his Chinese counterpart on Tuesday of the "rapidly deteriorating situation" and rights violations in Indian Kashmir, and called for India to look again at its policies there. The Feb. 14 attack that killed at least 40 paramilitary police was the deadliest in Kashmir's 30-year-long insurgency, escalating tension between the neighbours, and the subsequent air strike had heightened fears that nuclear-armed India and Pakistan could slide into a fourth war. 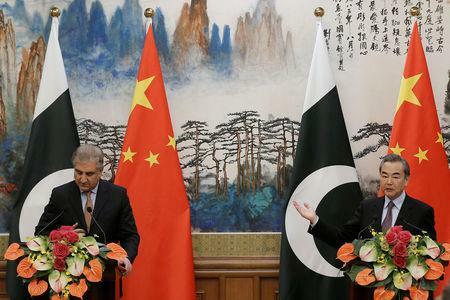 Speaking in Beijing standing alongside the Chinese government's top diplomat, State Councillor Wang Yi, Qureshi said his country appreciated the role China played once again "in standing by Pakistan in these difficult times". "I also briefed the foreign minister on the rapidly deteriorating situation on the Indian side of Kashmir, intensification of human rights violations, especially after Pulwama," he said, referring to where the attack took place. "This is a concern because that leads to a reaction and that reaction at times creates tensions in the region which must be avoided," Qureshi added. "I think there's a need for a new assessment on how the situation on the Indian side of Kashmir should be handled by the Indians. There are now voices within India that are questioning the efficacy of the policy that they've followed for the last so many years," he said, without elaborating. Wang, who is also China's foreign minister, said China has always believed that peace and stability in South Asia is in the joint interests of countries in the region and is what the international community wishes. 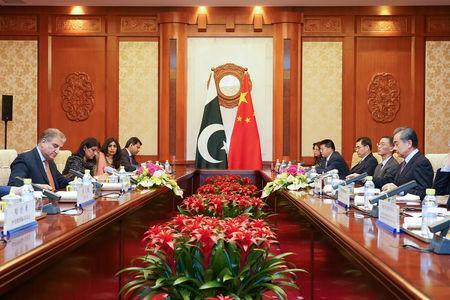 "China appreciates Pakistan's constructive efforts to ease the situation and calls on Pakistan and India to continue to exercise restraint and resolve the differences that exist via dialogue and peaceful means." The sparring after the Pulwama attack had threatened to spiral out of control and only interventions by U.S. officials, including National Security Adviser John Bolton, headed off a bigger conflict, five sources familiar with the events have told Reuters. At one stage, India threatened to fire at least six missiles at Pakistan, and Islamabad said it would respond with its own missile strikes "three times over", said Western diplomats and government sources in New Delhi, Islamabad and Washington. "As a friendly neighbour of both India and Pakistan, China pro-actively promoted peace talks and played a constructive role in easing the tense situation," it said. China is willing to work with the international community to continue to encourage the neighbours to meet each other half way and use dialogue and peaceful means to resolve differences, it said, without elaborating. China and Pakistan call each other "all-weather" friends, but China has also been trying to improve ties with New Delhi.